Last Sunday, my youngest daughter received a gift that nearly knocked me over…in a good way, of course. A lady in our church family, whom I knew to be a quilter, made an “I Spy” quilt for Maddie. I came upon the two of them after the service, over in a corner, with the quilt spread out on the floor, and Maddie’s head bent over the quilt earnestly searching for…two tinkerbells, a row of only Christmas, a teacup, four princesses, etc. This dear woman had spent countless hours making something beautiful, engaging, enjoyable, and hoping it would be a needed distraction from the daily diabetes routine. Wow! When someone gives a gift to your child, it feels like a gift to you, the parent. It meant so much to me, that she would love my little girl in such a tangible way. But when another creative person gives a gift from their creative wellspring…it means more than anything!! I KNOW that every stitch was woven with love and prayers. Every piece sewn together with thoughts and well-wishes for my daughter. Every “tumbler” chosen with Maddie in mind. It is not just fabric, thread, and batting…it is tangible love. Maddie carries this bit of tangible love around with her just about everywhere. In the car, she drapes it over her lap. At the table it sits on the back of the chair. When she gets her shots, she sits on it. When she goes to sleep, she asks me to put it on top of her and her covers. She is constantly asking someone in the house to play “I Spy” with her. She now has all the tumblers memorized. She loves to give you just three chances to find what she spies. I know a little of what goes into making a quilt. I made one many years ago, before children, using up some fabrics from which I had made dresses for myself. But I would not claim to be a quilter. I had never heard of an “I Spy” quilt. I had never heard of “tumblers”…I had to ask what she meant by that word. Definitely a word quilters use to refer to the shape of each piece of fabric. But what I DO remember about making a quilt, is how time consuming it is! Hours bent over a machine, adding batting, basting, hours making teeny tiny stitches with bleeding thumbs (until I learned to wrap them in bandaids), and then the edging…goodness me, the edging! I think it takes just about as long as the rest of the quilt put together! This dear woman thought it worthwhile to spend that kind of time, effort, energy, and creativity…on my daughter. Wow. A honey of a gift…a perfect example of how our creativity impacts others…I’m so glad to have been the recipient of this tangible love. Such a wonderful gift! This story makes me cry. Oh! I just spied a Scottie dog! My favorite! What a lovely story and gift. What a beautiful quilt and a wonderful gift. It is so wonderful that Maddie loves it that much. I’m a quilter and hope that every child will bond that much with the quilts I make. You should make sure that you give the quilter a photo of Maddie “loving” her quilt. I’m sure she’d be thrilled. What a wonderful gift!!! I am so glad you shared it with us. 🙂 Your friend is so kind, and you’re right- when someone gives your child a thoughtful gift, she is giving a gift to you as well! What a blessing. What a wonderful thing for your friend to do – such thoughtfulness and kindness. Brings a lump to my throat. What a wonderful gift! I am glad you shared this story with us. All the best to you and Maddie! The utter power of extending Kindness is truely Awesome to witness, even in the telling of it. There is a tumbler of Snowflakes 🙂 I love your portrait of Maddie with the quilt. 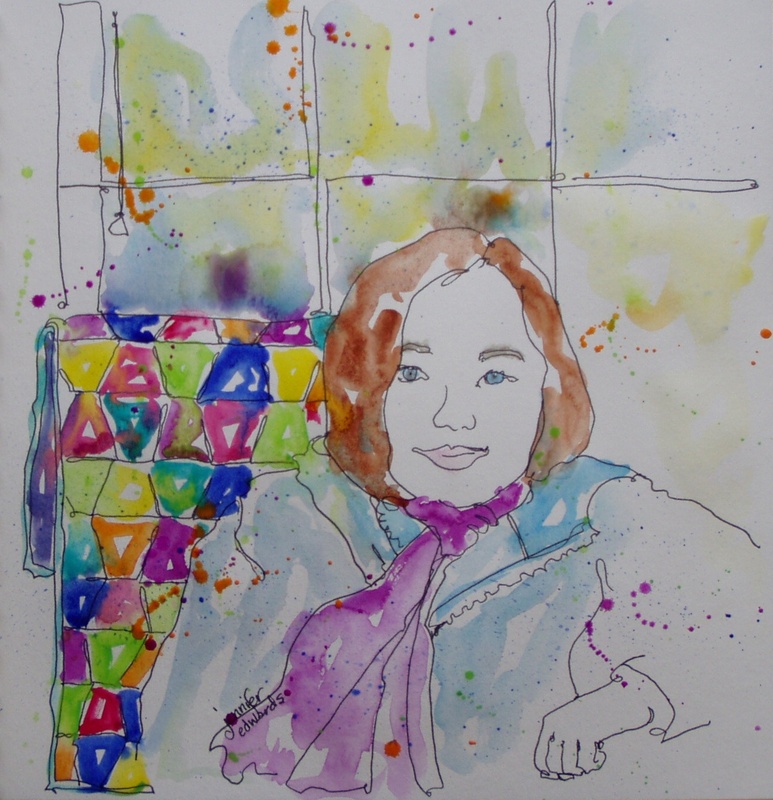 Just an aside, have you visited Ted Nuttall’s site to see his portraits? The portrait with the quilt in the background is lovely and I was touched by the story. 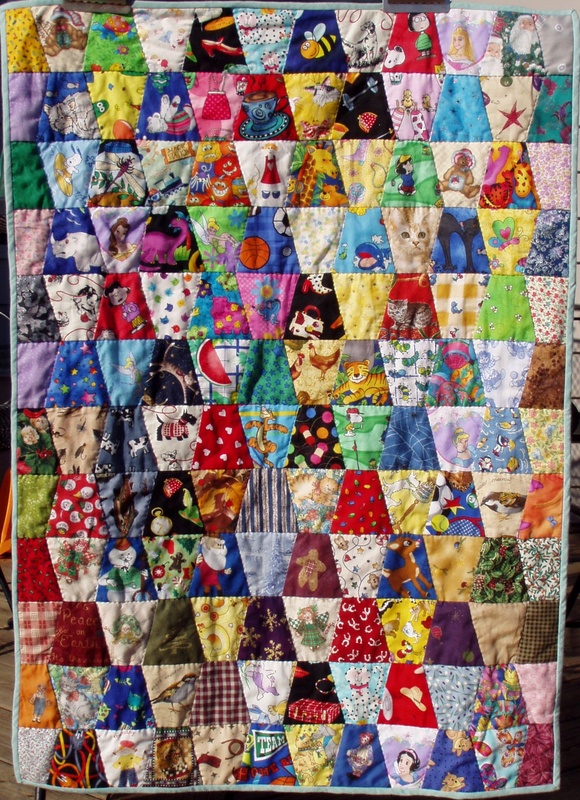 Quilts are really special and when they are made with love and prayers, they become treasures! I do quilt. This is a reminder to focus on special people who need and will appreciate the gift. Your story touched my heart. 2 Lucy’s, 1 Marcie, and a Snoopy on the golf course. Fabulous! An amazing story, thank you for sharing it! And your sketch is fabulous! How does one repay such love and kindness? She would be on my prayer list daily. What a touching gift and heartwarming story. A gift of love, and a love of the gift, definitely. So neat! I love quilts that are made with the person in mind. My grandma made me a quilt with fabric from all the dresses she had made me! It’s something I’ll always treasure. Beautiful quilt! I happen to have a friend who shares gifts from her wellspring of talent, too…. YOU!